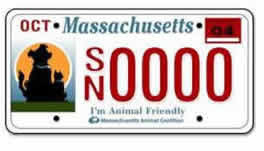 Did you know the "I'm animal friendly" license plates help support low cost spay/neuter programs? By purchasing a license plate, you will be contributing to a statewide program that directly benefits Massachusetts animals by helping shelters and rescue groups fund low cost spay/neuter programs. Almost half a million dollars has been distributed to animal welfare organizations since the program began in 2005.
with the Animal Friendly License Plate!